A leader in quality hose and fittings, FlexFit Hose offers customized PTFE hoses. These stainless braided hose assemblies are fabricated with 316L stainless steel fittings manufactured in-house on CNC Swiss machines. Improve the performance of your manufacturing equipment with these flexible and durable PTFE hoses. We can customize orders according to your requirements and recommend the correct series of PTFE hose assemblies for your application. Move your mouse over the product images to your left, then click the text to review and select your product type. By using the correct fittings, with no adapters, our products will help you make faster connections while eliminating leak points along your production lines. Implementing a series of dependable, properly calibrated hose assemblies and fittings can eliminate hours of production downtime. Regardless of what you require, our PTFE hoses, such as the B-Flex smooth-bore PTFE Hose, C-Flex convoluted products , ST-Flex silicone covered , or B-Flex-B carbon coated PTFE Hose , can be customized to fit your needs. From color coding and tagging to small or large quantities, you deserve to use the best. FlexFit Hose has experience working in a variety of markets, including Industrial Manufacturing, Process Instrumentation, Pharmaceutical & Biotechnology, Semiconductor Industry, Food & Beverage, Chemical Processing, Automotive & Marine, Military & Defense. Our solutions will enhance any process. If you need to control the flow of water or another liquid, our products can be equipped with fittings to do just that. At FlexFit Hose, we take pride in our quality assurance, testing every hose assembly before it is shipped. The quality of our PTFE hose is one of our top priorities, one we take very seriously. Our products comply with the following standards:USDA, FDA 21CFR177.1550, 3A Sanitary Standard, and USP Class VI; Along with these standards, our sanitary fittings comply with ASME-BPE. We always recommend you allowing us to fabricate your hose assemblies according to our strict quality standards and testing process. However, when you, or your customer has the capability and expertise, then order our stainless steel braided hose assembly components in bulk. You can store bulk, hose fittings & crimp collars on-site to deliver to the production line even faster. Ordering assembly components reduces your cost per component and shipment. 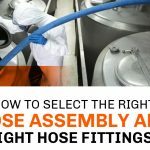 Here at FlexFit Hose, we believe it is important to select the right hose assembly for your process. Be sure to check specifications for each type of you are evaluating. These include: temperature ratings, working pressure, burst pressure and minimum bend radius. You can use our Chemical Compatibility Tool as a guide to make sure PTFE hose is okay to use for your chemical transfer process. If you are still uncertain as to the specific PTFE hose, fitting type or require something custom, Email us: sales@flexfithose.com, use our Quote Request Form to submit media, temperature and pressure requirements along with anymore pertinent details and we’ll help you determine the right hose assembly solution.